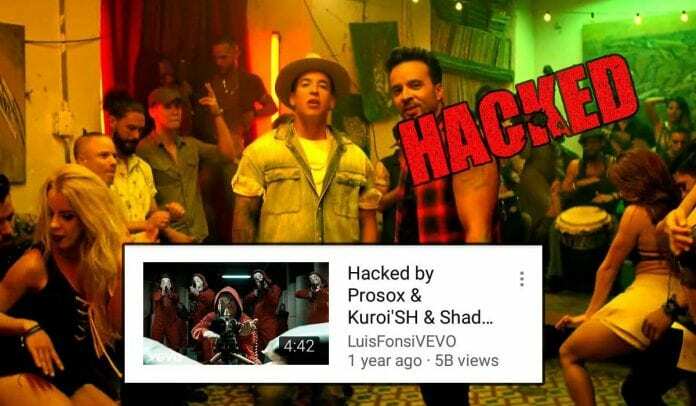 In what seems to be a hacker attack, the music video of the hit song ‘Despacito’, which had more than five billion views on YouTube has been removed. The original clips had been posted by Vevo, a music video hosting service that is a collaboration between the “big three” record companies, Universal Music Group (UMG), Sony Music Entertainment (SME) and Warner Music Group (WMG). Other Vevo channels of artists like Shakira, Selena Gomez, Adele Chris Brown, Maroon 5, Drake and Taylor Swift, were also inaccessible. For those unaware, the Spanish-language hit “Despacito” released in January 2017, and went on to break several records in music streaming, including one for the single with the most weeks at No.1 in the U.S., with 16 consecutive weeks. It also became the most-streamed song in the world after reaching 4.6bn plays. Meanwhile, the Despacito video has been removed, but its cover image shows pictures of five animated and masked people pointing guns at the camera. The hackers, who call themselves Prosox and Kuroi’sh, used the online moniker of Kuroi’SH and had written “Free Palestine” below the videos. “Don’t judge me I love YouTube,” it added. Both YouTube and Vevo have been contacted to comment on the issue.